Terrines, to me, were always a little mysterious. I kinda imagined that they were like jellied salads, only with more ingredients, usually including meat. 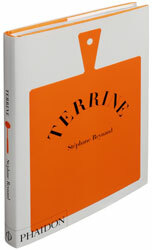 Reading through Stéphane Reynaud’s Terrine, I realized there was a lot more to it than that. Though to be sure, there are a few dishes that resemble meat in jellied salad. An earthenware cooking dish with vertical sides and a tightly fitting lid. By extension, the term also refers to food cooked in a terrine – traditionally a rich dish from layered meat. Contemporary recipes now include a much wider variety of ingredients such as fish, cheese, vegetables and desserts. Indeed. Terrine has chapters on each of the ingredients mentioned above. And from what I can gather from the book, a terrine essentially is a dish that is layered and contained somehow. My favourite chapter is about cheese, and recipes worth highlighting include Tomato Confit and Mozzarella, or the Brouse de Brebis, which is comprised of a thinly sliced zucchini layered with a soft sheep cheese. What is missing from this book is an introduction, perhaps something a little more about where the humble terrine came from, and why you might want to add it to your repertoire. In fact, the notion of the terrine isn’t even explained until you get to the glossary entry on page 167. But since the terrine is at the heart of French cooking, it’s a book worth leafing through for some new ideas on an old classic.